Davido takes it to new heights in his official music video to ‘Skelewu’. The video was shot last week Tuesday after the unofficial video directed by Sesan had been leaked on the net. The new video was shot in London by director Moe Musa in 'Skeleville' aka Wimbledon lol, same place he shot the video to Fuse ODG's number 1 single ‘Antenna’. The video to ‘Skelewu’ shows off the movement that's happening with the single in both Europe and Africa, as well as what's bound to happen worldwide. This may be Davido's biggest single yet, and I can't wait to see it enter the UK charts and takeover the dance scene as the latest and hottest dance in town. 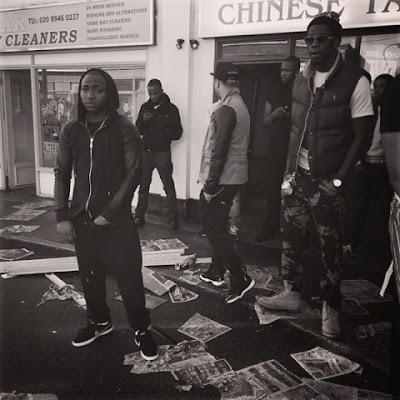 The video features cameo appearances from Hakeem of YFS (boy who converses with Davido), HKN's B Red, DJ Olu (Davido's official DJ), UK based Afrobeat artist Sona, D3 Dancers, YFS, and more. Watch the jam packed video to ‘Skelewu’.. You caught the ‘Skelewu’ fever yet? The video will be premiered exclusively on MTV Base UK on October 22.